Question for all of you out there. Have you ever read a book that you just couldn't put down. The book that will make you stay up all night and just to see what happens to the characters. There have been a few books that I have risked book hangover for and I am adding another one to the list. 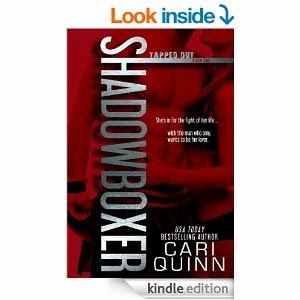 I bought SHADOWBOXER by Cari Quinn. I was hearing so much about it on a facebook page I am a part of . I was warned once I start it I would not put it down. They were correct on that one. Fighter Mia Anderson has faced the dark side of life and survived. But just getting by is no longer enough. To fund her new life with her baby sister, she's determined to beat the reigning king of the male fighters in New York's underground MMA circuit, Tray "Fox" Knox. Tray refuses to fight a woman, until he learns Mia's tougher than anyone he has ever known. He soon realizes he wants more from her than blows and blood, and he's willing to hit below the belt to get it. He'll fight her, but if he wins, she spends the night in his bed. All night long, his rules. No tapping out. Mia agrees, certain that he'll lose. What she doesn't realize is that Tray loves to fight dirty...and that this match may end up being the most important one of their lives. What can I say about this book. I was warned by a lot of people that it was dark . I didn't realize how dark it was. Mia has seen such a dark life. She has been through so much in her life. She becomes a MMA fighter to help ease the pain from her past .Wanting to help her younger sister and her to disappear from the darkness. Enters Tray the fox another MMA the man she wants to fight to win the title so she can just leave . They meet one night at the bar where she works and thing proceed from there. She is smitten with the hot man in front of her but they are dealing with the darkness in their lives. Will they survive the past to try and have a future . This book was tearing from my heart strings from the very beginning of the story. To have that much pain and darkness just tore at my heart. Cari brought the characters to life with such a rawness and a passion. Cari wrote Mia with such a intensity that made you feel for her and wanted to help her out of the darkness. She captured the struggle that Mia has just trying to be normal , or normal in her eyes . Tray is the alpha that is actually has a heart and his own brand of darkness that he is keeping under control also. These two characters will claw and fight their way into your hearts . Cari has said that writing the character of Mia, helped heal her in so many different ways and Mia gave Cari her sense of hope back.